HOW PADMAVATI CREDIT CO-OPERATIVE SOCIETY LTD. PAY MORE INTEREST TO ITS DEPOSITORS? 1. The society need not to pay income tax on the earnings. Under the Income Tax Rules, the income from the loan interest has tax exemption. Therefore, the society saves about 35% and this becomes a considerable amount with the society that is being utilized for giving loans. This increases the income of the society. This is the reason we are able to pay more interest to investors as compared to other organizations. 2. The society need not to have reserve liquidity funds against S.L.R. The banks have to keep 24% of the deposits reserve against the S.L.R. The rate of interest on S.L.R. reserve is less than the rate of interest the banks accept the deposits. Thereby the banks go in loss and adjust this loss while calculating the rate of interest for their investors and they are bound to keep their rate of interest lower on deposits. Whereas, the societies need not to keep reserve funds against S.L.R. and have additional funds of 25 lac for loan against the deposits of 1 crore. The investment of this additional fund increases the profit. 3. The society need not to maintain cash reserve ratio (C.R.R.). The banks have to keep 6% amount reserve as C.R.R. against the deposits. It means on deposits of 1 crore, banks have to keep 6 lac as reserve funds against C.R.R. having no income on this fund. Whereas, the society have this fund to give on loan and earn more profit. Due to all above reasons, the society earns considerable more profit and pays more interest to its investors. 4. The society invests at more rate of interest as compared to interest ratio on deposits and society / investors are benefited with this difference or interest rates. 5. As the society invests in short term small loans, there is no risk of bad debts and the repayment installments are of small amount keeping cycle of funds rotated speedily without obstacles. The main aim of the society is to work towards promoting tendency of savings. In the present scenario when people tend towards 'EARN AND BURN', it is very important to have tendency of savings for developing self sufficiency in finance at individual and social level as well. Let us rebuild nation's glory of the time when it used to be called 'Golden Bird' by promoting savings at village level. The society is working in this direction with a feeling that it our social responsibility. To motivate maximum number of people for savings, the society has fixed higher rate of interest on deposits and investors are able to get good profit. WHAT ARE OTHER BENEFITS TO DEPOSITORS OF PADMAVATI CREDIT CO-OPERATIVE SOCIETY LTD.? One percent additional interest is payable to; investors more than 51 years of age, woman, handicapped, defense personnel, retired defence personnel, employees of central government and state government, employees of all banks and insurance field, employees of public undertakings, employees of government and semi government establishments, working employees of any Co-operative society, employees of local bodies, retired person, trust and single deposit of Rs. 5 lac. As per present rules of Income Tax, TDS is not being deducted on the profits earned on deposits. The facility of payment before maturity and loan on pre-mature deposits is also available. 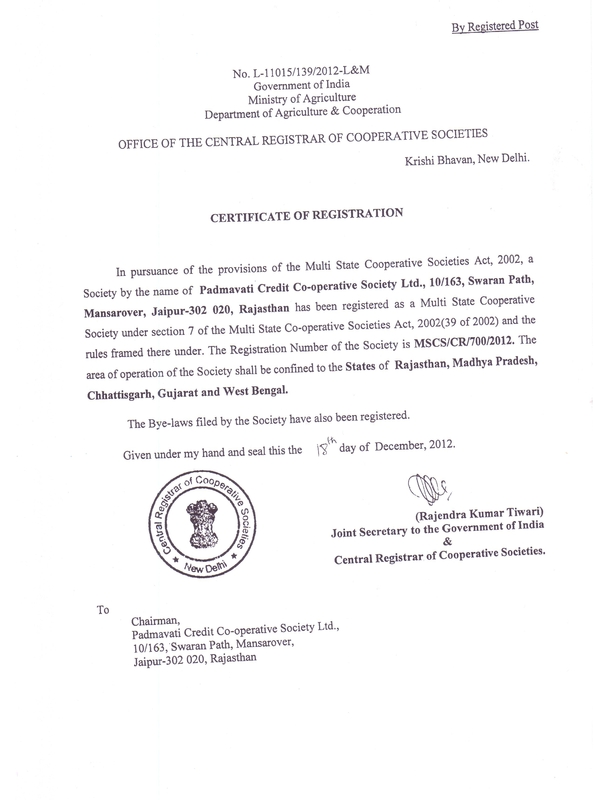 Padmavati Credit Co-Operative Society Ltd is registered under multi state co-operative societies act 2002 regulated by the Government of India with its registration no. MSCS/CR/700/2012. It is compulsory by law for societies to adhere these rules and regulations. The society being a Co-operative organization, the ownership of the same doesn't't rest with any individual but all the members have the ownership rights. The members of society elect governing body by democratic way and elected body governs the operations. The policy matters are decided by governing body in general with full transparency. The Co-operative department also keeps vigilance on the operations of society. On the other hand, the ownership of finance companies rest with individual and the policies are formed accordingly. The general public and customers have no right to interfere in the operations of finance companies. Therefore, there are more chances of having no transparency. The customers do not have sufficient knowledge about the finance companies and they have limited law coverage. Padmavati Credit Co-operative society Ltd. under the law is fully answerable to its members and customers. The society adhere all rules and regulations meant for. WHO SHOULD INVEST IN PADMAVATI CREDIT COOPERATIVE SOCIETY LTD.? All those interested for good returns on their short, medium and long term deposits can invest with us in different schemes. WHAT IS THE MINIMUM AND MAXIMUM AMOUNT LIMIT THAT CAN BE INVESTED WITH PADMAVATI CREDIT COOPERATIVE SOCIETY LTD.? The minimum amount of investment is defined and varies from scheme to scheme and there is no upper limit of amount for deposits. Any adult person, undivided Hindu family, company, partnership firm, trust, organization, cooperative societies etc who are the members of Padmavati Credit Cooperative Society Ltd. can invest in different scheme. HOW Padmavati PERFORMS THE WORK OF MICRO CREDIT AND MICRO FINANCE? The society accepts deposits on a higher rate of interest. Therefore, it is natural that the rate of interest will also be higher side on loans being offered and society earns profit. Higher rates of interest cannot be received on big amount of loan and the chances of bad debts are more. Therefore, the society issues short term loans of small amounts. The experience of the management is that in micro finance, higher rate of interest can be received easily on small and short term loans. This is the reason that micro finance is given to small loans. All the schemes of society are of short term deposits where Recurring Deposit (R.D. ), Daily Deposit Scheme (D.D.S. ), and Fixed Deposit Receipt (F.D.R.) for one month to 10 years are important schemes. The funds received through Micro Credit plus profits thereof are invested in Micro Finance Schemes. Daily Loan Scheme (D.L.S. ), two wheeler, three wheeler loans (T.W.L. ), Mortgage Loans (M.L. ), Personal Loan (P.L.) and Consumer Loan (C.L.) are the important schemes of PADMAVATI CREDIT CO-OPERATIVE SOCIETY LTD. to two years of time period and one lac amount.